Robyn A Sayer is a Doctor primarily located in Hickory, NC. They speak English. Have you seen Robyn A Sayer? Dr Robyn Sayer is supremely knowledgeable, professional, dedicated, skilled, thorough and approachable. Because of the urgency of my stage 3 ovarian cancer I didn't have the opportunity to choose my surgeon, so I count my lucky stars that I was referred to her. I had my surgery 5 years ago and I owe my survival to the best and most caring surgeon, Robyn Sayer. Dr Sayer is the absolutely perfect Doctor who cares deeply for her patients. She makes you feel like there is hope when you didn't think there was. I would be more than happy to put my life in her hands and I did. Dr R Sayer and the team took care of my needs from what was happening, what will happen and the final result. Dr R Sayer has a fantastic manner and understood my situation and managed it with care and genuine concern. She simplified things and I trust her decision's. After 39years of 5 caesarean's, a hysterectomy by the time I was 29 years old with all the scare tissue she had to deal with I am forever grateful for her and the Westmead Team that I can breathe normally, lay on my right side again, stand up straight and many other changes that have improve my health and life. Bless you always. We are sorry, it looks like we don't have insurance information. Please call Robyn A Sayer's office for more information. 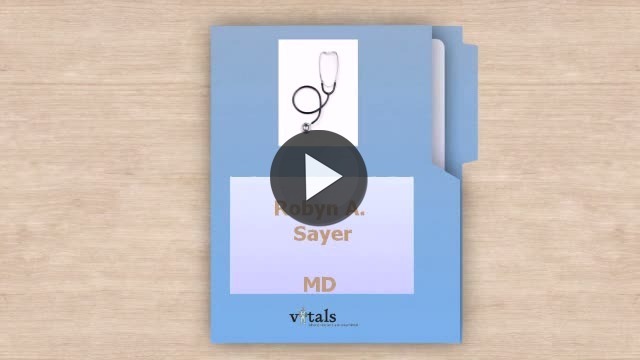 Take a minute to learn about Robyn A Sayer in Hickory, NC, in this video. Robyn A Sayer is similar to the following 4 Doctors near Hickory, NC. Have you had a recent visit with Robyn A Sayer? Select a star to let us know how it was.